Located in the residential, quiet neighborhood of Kefalomandouko. Standard capacity 6 people. Extra charge for up to 3 extra people, payable on the spot. 3 bathrooms +1 toilet. Ideal for families with young children/teenagers and couples traveling together. Not suitable to noisy parties! Lovely fusion style house, with private pool and beautifully maintained gardens. Air-conditioned. Luminous interior, various patios and sunny verandas for outdoor activities. Very close to the lively historical downtown. Easy layout of the house, spacious lounge at garden floor,dining room', wc closet, fully equipped kitchen with fit in BBQ next to it. Sheltered outdoor dining space. 1queen bedded master room with en suite bathroom+1 twin room and bathroom on first floor. 1 french double suite with bathroom and large private veranda on second floor. Free WIFI, cable TV. Car rental, Private Yoga therapist, beauty treatments, massage, Greek cooking lessons are available upon request at very reasonable cost. Distance to the Airport, 4 km. Shuttle bus stop 250 m.
Easy access to St Michael and St George Palace, the Liston Arcades, the Palaeopolis(Mon Repos) Palace, the Old and New Fortress citadelle, the upmarket all day beach bars like Naok Azur, Faliraki, Royal Baths, from 3 to 4.5 km away. I am Katia, graduate of the Hartwell House of Citizenship and Appreciation of Art, Buckinghamshire, UK and the International Institute of Glion of Tourism and Hotel Business Studies, Montreux, Switzerland. I am Greek by birth,(corfiot) and Swiss by my former marriage. Lived abroad a lot, especially in Switzerland as a hotel owner; I travelled the world and decided to settle in my beloved Corfu some years ago. In the Summer, I spend most of the time in the north of the island, looking after my business. This is why I decided to rent the villa Katia which was initially my holiday home, when I lived abroad. I immediately loved this piece of land, with its 10.000 sq.m luscious Nature which belonged to a local, noble family. 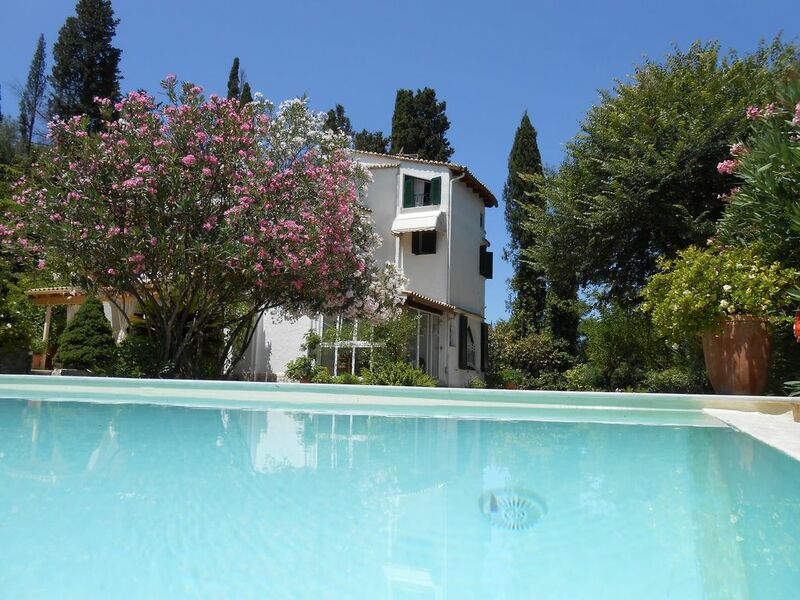 I had always wanted a house near the interesting City of Corfu and yet have the sea closeby as well as the privacy of a large property; I am an all year round, every day swimmer,so this location was more than perfect for me. The house was built with very special care: the marble floors, the high quality imported timber for the wooden parts as well as some fittings and objects gathered from various countries that I had visited.I tried to match luxury with "easy going" modern comfort and give the possibility to all members of the family to have some personal privacy. The result seems to be a fusion of Upper and Lower Mediterranean styles. The spacious and airy semicircular living room naturally forms 3 different sitting areas, including the "TV corner". It leads on to the dining room (sitting 8) and the open plan kitchen. It is furnished with comfy couches and soft armchairs. Corfu Golf Course is 15-20 minutes drive on a good standard national road. Handicap not necessary. Equipment for hire on the spot. The course itself is a delightful site with lakes and rivers and full of mature trees. Notes on accommodation: Amenities/Facilities. Air- conditioning, outdoors in-built barbeque ensuite to the kitchen, sheltered parking, iron/ironing board, satellite flat TV in living room and penthouse bedroom, free wifi inside/outside, central heating, audio system, DVD player, 2 open fire places, safe, spacious wardrobes, hair-dryer, baby cot, high chair. Built in 1986. Refurbished 2011 and constantly improved. Approved by the E O T (Hellenic Tourism Organization). Utility room: washing machine for your use. Check-in: 3pm Check-out: 12am Flexible if needed. Day use extension till late evening, for some extra charge,if the villa is available; otherwise there are arrangements with the resort hotel nearby, where our guests are welcome to spend some hours around the pool, waiting for a late flight. Outside: Exceptionally large gated property, including a private wood and orchards, sunny pool next to the house, outdoors dining/entertaining area, shaded patios or sunny spots, all adapted to the season and the mood of of the guests. Private swimming pool (8m x 4m). In-built barbeque. Open and covered terraces. Extensive gardens and orchards. Private parking. Cleaning / Towels / Linen / Maid service: Maid service: three times a week. Towels change: 2 towels per person, twice a week. Pool towels provided. Bed linen: weekly change, twice per week in July and August. The villa is lovely, very spacious, with lots of flopping out places and with well kept gardens and pool. The location is excellent being close to Corfu Town - within walking distance (30 minutes) if it hadn't been so hot - yet in a quiet part if you ignore the planes which were regular and loud but didn't really intrude and stopped overnight. The bus service is very good as you could reach a number of different routes from the villa. There is also a supermarket within walking distance (10 minutes) and places to eat near the port (10 minutes walk) although the kitchen is well provided and we often ate at the villa. We found we didn't need to hire a car. The owner was extremely helpful, particularly when we arrived quite late, and was keen to ensure we had an enjoyable stay which we did. I have just noticed your kind review in the OWNERS DIRECT site. This is probably because there has been a gap in publishing the villa Katia description in their Corfu pages. Now all is fine, and I so much appreciate that you took the time to describe the villa and write your comments; this matters a lot to me and the future guests. I dare hope that you would be willing to come back again, then I would be very happy to offer you the special offer always reserved to "repeaters". The villa is fantastic ! we have a great relaxing holiday - Katia couldnt have done anymore to help us to have an enjoyable time - She brought fresh spa water everyday as well as oranges from the orchard. We stayed 6 days but could have stayed 60. Everything you need from a property, and a host. The gardener and maid visit regularly and thier care and attention is evident. You have everything you need, with extra shops and restaurants around the corner. There is very good air conditioning in the bedrooms, and plenty of fans and shutters downstairs keep that floor cool. Plenty of shade and trees, too. In August 2015 there was a lean, friendly mother cat with four baby kittens living in a cave on the hill above the BBQ. We named her "Mrs. Huggins" so if you see her or the kittens, please say 'hi' from us. Thank you very much for your kind comments on your stay and the villa. I enjoyed having you staying in the house: nice guests usually have a nice stay! The cat and the kitten are doing very well. Everybody has been kind to them so far. I wish you a nice Autumn and hopefully, shall I have the pleasure to see you again sometime in the future! So many positives which I will try to capture to provide a fair and useful insight into this property and its owner, Katia. One of the most memorable moments that will stay with me forever is the vision of blooming beauty that greets you as you drive up to the villa - truly picturesque and certainly a 'wow' moment. The villa is well-equipped, spacious and clean and its sprawling layout adds such character - a unique villa full of nooks and crannies and interesting lines. The views of the coast and surrounding gardens from one of the many balconies are beautiful and the pool is the perfect oasis (it's about 5 feet deep from end to end and thus great for swimming and games though safer as no diving taking place!). In relation to Katia, we could not ask more from our host; from our enthusiastic greeting in the early hours and throughout our stay Katia is determined to ensure all guests have everything they need. She had made us a simple but delicious meal and left wine which was so very much appreciated. Her extensive experience in the hospitality industry is clearly evident and the tour of Corfu Town was informative and thoroughly enjoyable. As with everything in life there is always a compromise to be had and these were ours: showering facilities are limited (hot water, power and positioning of shower head); and mosquitos - lots of, in abundance, due to the lush gardens leading to some very uncomfortable moments which did mar an otherwise perfect holiday. In terms of location, it is isolated but the upside is that it is very quiet. There is a well stocked mini market within 10 mins walk and several bars, cafes and restaurants with views of the shoreline about 20 mins walk away. Our favourite is Mylos cafebar and restaurant where the Greek food was delicious and the customer service exemplary - after our first visit our table would be laid up waiting for us and we felt like VIPs! Beef stifado has melt in the mouth beef and the kebabs are yummy - certainly not like the greasy ones in the UK! Taxis are 10 Euros for local journeys which makes a trip to the supermarket and Corfu Town quite expensive and not least because we needed two taxis as there are six of us. We would highly recommend Tasos as his English, sense of humour and local knowledge makes him a great impromptu tour guide! Hopefully this review reflects a top quality property and its delightful owner, Katia and the fabulous holiday we all had. Kita Villa was simply fantastic so many rooms on so many different levels, this is a big villa, fab pool, and very private, everything is here including Wi-Fi. Good supermarkerts are just around the corner and there cheap, also had maid service during the week, it doesn't get much better than this. Corfu is in walking distant, or pay 5 euros for a taxi, buses are great for getting around and above all it's safe. Will be back. Thank you so much for your kind comments appearing in the "OD" site. It has become necessary for future guests to have read the reviews of any place before they make their choice! We all had pleasure in having you staying at the villa Katia and especially the staff will remember that anytime they came in for cleanning, there was almost nothing to do: the house was almost ..untouched! Villa Katia is a beautiful period house which is very well maintained and eclectically furnished. It is set in its own extensive gardens but feels very secure and private. The villa is well situated for touring Corfu Island and we feel a car is essential if exploring is what you want to do, however the driving on the island takes some getting used to. The owner, Katia, offers a guided tour around old Corfu Town which is extremely interesting and she, and her staff, looked after us very well. The pool at the villa is lovely and catering facilities are more than adequate, including a lovely BBQ in the patio area. Staying at Villa Katia enabled us to explore the various beaches around the island and we particularly liked Kalami, Glyfada and swimming amongst the fish at Paleokastritsa (make sure you have a mask and snorkel to fully enjoy it!). Our experiences eating out were varied, but we had a lovely meal in a taverna overlooking the sea on the road between Corfu Town and Kalami where the local food was great and good value for money. We found Corfiots were all very friendly. Thank you so much for your nice comments on the villa Katia! It is always so encouraging to hear that my Guests enjoyed their stay in Corfu, that the house suited them and that all I am trying for, helps the people to have a nice holiday. This is true satisfaction for me. Thank you for publishing your comments, this helps me better than any advert, above all. The distances from the famous beaches like Glyfada or Paleokastritsa (west Corfu), Kassiopi or Sidari (north), Issos or Paramonas (south) go from 8 to 35 km. Many charter companies, especially Easy Jet and Ryanair connect the Island with the UK as well as various European and other destinations.There are also many regular flights by Aegean Airlines, Olympic Airlines. Upon arrival, a taxi transfer is recommended. Rent-a-car companies can be recommended at a reasonable cost (not commissionable!). The distance to the airport is 3 km while the port is just 1 km away. The lively Historical Corfu Center is 1,5 km away. At 2,5km distance away the St Michael and St George Palace, former Residence of the British Governor, reminds the times when Corfu was a British Protectorate. Just next door, the Gerald Durrel public garden brings you closer to this great Corfu lover! The location of the villa allows it's guests to choose their activities on an individual basis by being central to a plethora of choices. A city bus stops just at the end of the track leading to the house, every hour, taking you to the UNESCO listed Old Venetian Town with it's beautiful architecture, museums, esplanades, the up-market restaurants, tavernas and the cozy cafes; just a 5 minute drive! The Kontokali beach with watersport activities is 2.5 km. The next mini market is 500m; the next supermarket as well as tennis and bowling activities are close by. The famous Theme Waterpark Aqualand is just 8 km away. Enjoying alfresco meals in the outside sitting area from April to October, sunbathing at the unoverlooked pool and terraces, bird watching in the mini-wood and the orchards; by an early or late season chilly night enjoy the fireplace. Live in the countryside while never feeling isolated in some remoted resort. Ideal location for those interested in local festivals, like the famous Orthodox Easter in April or May, the music, folkloric and art events, pop concerts, all of them taking place in the various Landmark sites of Corfu Town, well known for its cultural tradition. Even one person alone, can feel homely in this house. Young ones may just walk safely to the clubbing neighborhood nearby. Katia, the owner, highly trained in Tourism, runs the house and can easily be contacted for any info on sight-seeing, excursions, restaurants, always eager and able to help! Marriage parties, special birthday evenings can be organized within the property. In case one of the guests needs frequent medical care even during vacation, the Hospital and the private Polyclinic are very close to the property. Booking Notes: For a valid booking a downpayment is required. Full payment will apply according to arrangements with the owner. Changeover Day: Flexible.